There has been an arctic freeze over Ireland for the past week. 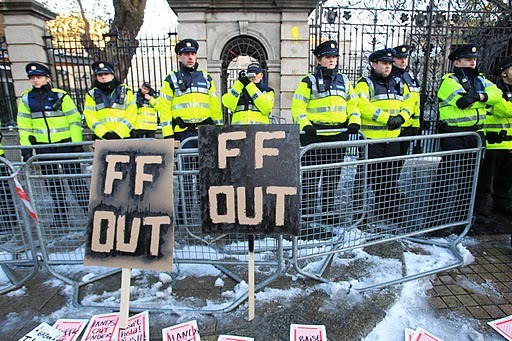 But despite all the snow, nothing chilled the blood here last week as much as the details of the 85 billion euro bailout that the International Monetary Fund (IMF) and the EU is giving to the Irish government. The document containing the full details was published last Wednesday, and reading the conditions that are attached to all that money was a humbling experience. The government had been telling us that accepting the money from the IMF would not take financial control away from the country and would not diminish our economic sovereignty. Such talk was scare-mongering, they said. Well, all I can say to that is have a look at the document yourself and see what you think. Don't just read the summaries and analysis in the papers. For the full flavor of just how demeaning this document is for Ireland you have to read the details for yourself. It's not that easy to find on the Internet, but it's worth the effort if you want to see at first hand who is really in control of Ireland these days. To find the document go on to the RTE website (www.rte.ie/news) and put details of IMF agreement for Ireland into the search box. Click on the first item in the menu that comes up: quarterly reviews part of EU/IMF Rescue Deal. A couple of paragraphs into that text you will see a highlighted line which says click here to read the full document. And when you click on that, up it comes, the full document in all its humiliating detail. This is the driving force behind this week's draconian budget in Ireland, the most severe in our history. This is the reality behind all the waffle about how the EU and the IMF are giving us the money, agreeing the headline targets for the state's finances with us, and then leaving us to work out and implement the details of how the targets are to be reached. The reality is that the document sets out in exhaustive detail an economic plan with a strict timetable which will force us to reach the agreed targets in reduced spending and extra taxation within the agreed timescale. Failure to stick to the plan will mean the €85 billion money stream will instantly dry up. The document also sets up an agreed monitoring system which will allow the EU and the IMF to check on exactly how we are keeping up with the plan, so that corrective action can be taken if we start to fall behind. The reality is that the document treats us like a nation of untrustworthy incompetents who can't be relied on to tell the truth or to stick to a plan. The level of monitoring that we had to agree to is shocking. It doesn't get down to counting paper clips, but it's not far off. To get an idea of this, scroll down to the bottom of the document, to the part called annex 1: provision of data. This gives a list of the information that has to be given by the Irish authorities to the EU, IMF and ECB (European Central Bank) on a regular basis. Every week, for example, the government has to tell the IMF, the EU and ECB how much tax it is taking in and how much it is spending. That's every WEEK, not every month, or every three months. It's the detailed way this is set out in the document that is really humiliating. For example, the Department of Finance has to give "information on the main government spending and receipt items -- weekly, on Friday, reporting on the previous Thursday." The precise nature of this wording is almost contemptuous. Certainly it leaves no room for back sliding. Particularly spending over-runs. And that's just one example. The document has a very long list of agreed changes that are to be made in the finances of the Irish state and in the Irish banks and the reporting time to the IMF and the EU on each change is set down. The banks, for example, have to give a WEEKLY report on loans they are giving out. They have to give detailed information on deposits every month, including how long deposits are for, whether they're from individuals, companies or other banks. The banks have to give monthly data on how much debt they have falling due over the following €36 months. On the state payroll, for example, the document states that the numbers and paychecks of all state workers have to be reported to the EU and the IMF every three months. All these state sector workers will have to meet savings targets within nine months or their pay will be cut to make the savings required. The document also includes details of extra taxes, like property taxes and water charges, that are to be introduced. Apart from the €6 billion reduction of the budget deficit in 2011 which was delivered in this week's draconian budget, the document says reductions of €3.6 billion in 2012 and €3.1 billion in 2013 are also a condition of the bailout deal. Much of what is in the bailout conditions was expected. We all knew that massive cuts in spending and heavy increases in taxation were on the way. But the detail of some of it is surprising. Like the specific targeting of Ireland's overpaid professionals -- especially the lawyers and doctors -- and the statement that their charges have to be driven down within nine months. This will be done by opening up the "closed shop" of the various professions so that people can get in more easily, and there will be much more competition. Also interesting is the way the document talks about the sale of semi-state companies, with the proceeds being used to reduce the national debt. The bottom line in the document is that the loans from the EU/IMF to keep the country afloat for the next four years will only be paid if the agreed targets are met, to the agreed timetable. That means fast action on huge cuts in government spending, no matter how painful. It also means taking much more tax from those in jobs, especially higher earners. It's all about balancing the books as quickly as possible. In fact looking over the agreement with the EU/IMF, it's hard to disagree with most of what it contains. Most of the details are changes that the Irish government has been promising for years, but never had the cojones to implement. These changes are about shrinking a government and state sector that has become way too big and way too costly. They're about tackling the vested interests in Irish society -- from the €1,200 a week plumbers to the million a month developers -- who paid so little tax because there were so many loopholes. Another of the vested interests here are the state sector workers, the only area of the Irish economy in which the unions are still all powerful. The government has been terrified of tackling them and still clings to the doctrine of social partnership, a system which has meant no strikes but very high wages. State workers here earn far more than their counterparts in Northern Ireland, for example. As tax revenue dried up over the past three years, the government tried to reduce the enormous state payroll bill by cutting pay slightly. The now infamous Croke Park Agreement with the state sector unions over a year ago was supposed to deliver further savings by greater efficiency. In return the unions were promised there would be no further pay cuts and no forced job losses. Given the state of the country's finances, this was an incredible deal for the unions. But so far, in spite of the crisis, only minimal savings have been achieved. Now the EU/IMF document makes clear that unless major savings are forthcoming within nine months, there will be major cuts in state sector pay. So no more procrastination. The truth is that for the last few years, the government has been trying to deal with the spending and taxation issues that are tackled head on in this document. Now the "memorandum of understanding" with the EU/IMF published last week has done so at a stroke, without fear or favor. To that extent, it is to be welcomed. In fact if we were only concerned with sorting out the state's finances, the budget deficit, the conditions outlined in the EU/IMF €85 billion bailout document would be perfect. But the problem is that we are also trying to fix our banks, because two years ago the state gave an absolute guarantee to all depositors in our banks. That guarantee effectively transferred the private debt of our banks into the sovereign debt of our country -- a move that was, in retrospect, disastrous for the ordinary Irish taxpayer. Fixing our banks as well as the state finances means our bailout money has to be much more than we can really afford to pay back. And that is why, although there was no immediate alternative to us taking the money and although many of the conditions in the agreement will be good for us, there are now big question marks over our future. The interest rate we are being charged is penal, only marginally less that we were paying on the markets before we withdrew. And this adds up to a huge annual interest bill, billions that will have to come out of our tax revenue before we start to pay for services like schools and hospitals. This will have a depressing effect on economic activity here, and it is open to question whether our economy can recover any time soon with a debt service burden that is so heavy. The EU/IMF have nothing to say about this scenario, instead taking the optimistic view that we will recover quickly enough to pay all our bills and get back to a normal state. They are not in favor of making the bondholders in Irish banks carry at least some of the burden, which would be one way of quickly reducing the €85 billion millstone around Ireland's neck. But that is one issue that is not going to go away whether the EU/IMF likes it or not.